Along with my other freelance logo design guidelines, and specification templates, available to you, I now have added this 8 page logo sheet and style guide as a downloadable template. 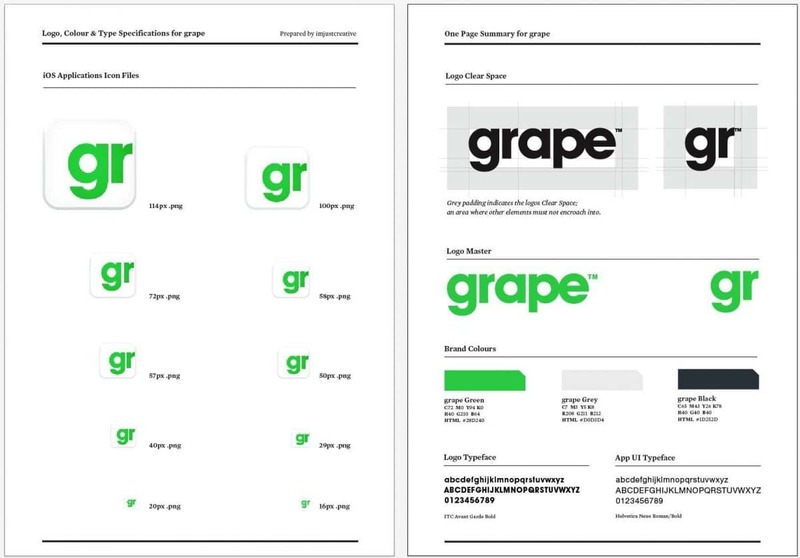 The ‘grape’ logo is a current project I am working on, and so these guidelines have been designed specifically for the client. It’s not fully complete as I have yet to add details on the stationery, further info on how the logo can be used etc, but these eight pages provide the main details. This freelance logo design guideline template is a little different to my previous ones, as it incorporates a page of iOS application icons which go hand-in-hand with the project, more info on the typefaces as well as providing a final artwork logo sheet. I have also summarised the seven main pages of logo, typestyle, colour and icon guidelines into a One Page Summary as a convenient extra for the client. I have removed all instances of the ‘grape’ logo from the template, and replaced the icons with black placeholders. I realise it then looks a little naked, but just used the guidelines I had in place as positional to place your own logo, and then adapt those guides as needed. It’s more about just being able to provide you with something to get you a head start in you own project. This should all still provide you with a sound base to adapt your own logo sheet and guide from. You can download the template from the following link. All fonts have been converted to outlines and I have provided both .ai and PDF versions. If you require another format, then please drop me a line in the comments and I’ll see what I can do for you.